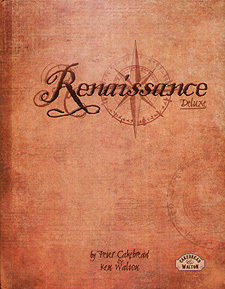 Renaissance is a D100 roleplaying system designed for historical and fantasy gaming in the age of black powder weapons. It features familiar mechanics, grim and gritty combat, extensive period weapons and equipment lists, dozens of professions, and rules for factions and belief systems. It also includes two magick systems - Battle Alchemy and Witchcraft. The Deluxe edition has been expanded with new spells, weapons and factions, and historical notes for the period from the Renaissance to the Napoleonic era, as well as new rules for Sanity (first introduced in Clockwork & Cthulhu) and Quick Combat. Numerous other optional rules and ideas are included, as well as extensive notes for games masters. All rules are optional, allowing you to tailor the mechanics to your own campaign. Released under an Open Gaming License, which allows companies and individuals to incorporate the rules into their own games, it also showcases and expands the rules system of Clockwork & Chivalry 2nd Edition, and is written by award-winning game designers Peter Cakebread & Ken Walton (UK Games Expo Award, Silver Oggie Award, DieHard GamesFANS Award, Steampunk Chronicle Award, Origins Nominee).